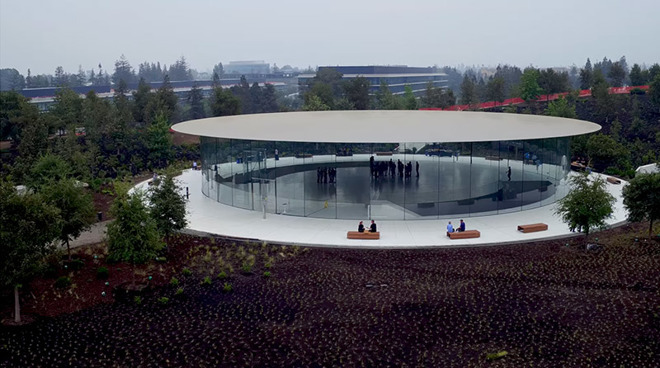 Exactly one week ahead of Apple's Sept. 12 special event, drone pilot Duncan Sinfield takes to the skies to offer one last look at Apple Park before the company is expected to hold its first ever product unveiling at the campus's Steve Jobs Theater. Construction is steadily progressing at Apple Park in Cupertino, with landscaping changes being surprisingly noticeable considering Sinfield's latest flyover comes less than two weeks after his last highlight reel hit YouTube late last month. This week's video shows a nearly complete main "spaceship" structure, with no sign of scaffolding or machinery on the building's exterior. Desks can be seen in some windows, as well as seating in common areas and the central cafeteria. Landscaping work is also nearly finished inside the main ring. It appears contractors have in the last week removed the protective shielding from a small pond that will sit among a grove of local fruit trees in the ring's courtyard. Standing on a man-made hill near the circular office building is the Steve Jobs Theater, where Apple plans to hold next week's special event. As seen in the clip, construction crews have largely vacated the area, leaving employees to mill in and around the enclosed glass foyer. Inside, underneath the massive carbon fiber canopy, a wide open space is flanked by two curved staircases leading down into the 1,000-seat theater below. Apple is slated to unveil a slew of new devices at the Steve Jobs Theater next week, including a flagship "iPhone 8," an LTE Apple Watch and fifth-generation Apple TV with 4K HDR capabilities. AppleInsider will be at Apple Park on Tuesday, Sept. 12, with live coverage of the event.